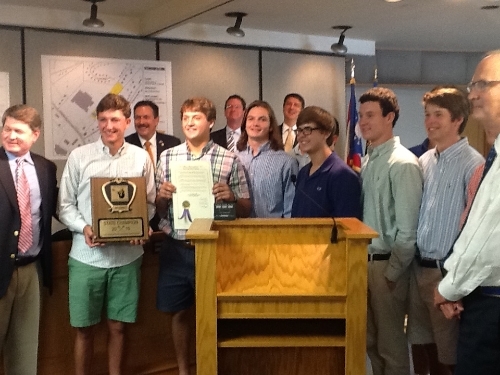 St. Xavier's Lacrosse program was honored with a proclamation at the Hamilton County Commissioners Board Meeting on Wednesday, June 24. Head coach Nate Sprong addressed the Board and then the team was given a proclamation from the board. It was the Bombers 3rd State Title in Lacrosse but first at the Division 1 level. St. Xavier beat Upper Arlington 7-6 on Saturday, June 6th to take home the title. The Bombers finished the season with an 18-5 record on the season and look to build on their success for the 2016 season. WHEREAS, St. X was the first team from southern Ohio to ever advance to the Division 1 State Championship Game. 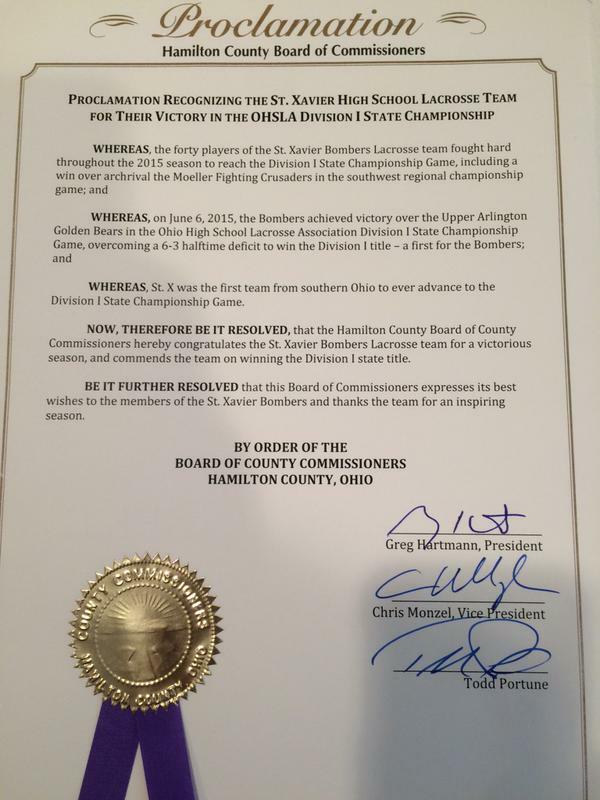 NOW, THEREFORE BE IT RESOLVED, that the Hamilton County Board of County Commissioners hereby congratulates the St. Xavier Bombers Lacrosse team for a victorious season, and commends the team on winning the Division 1 state title. BE IT FURTHER RESOLVED that this Board of Commissioners expresses its best wishes to the members of the St. Xavier Bombers and thanks the team for an inspiring season."